This page is about the Italian attacker P.108A serie 2. For the bombers, see P.108B serie 1 and P.108B serie 2. The P.108A serie 2 is a rank IV Italian attacker with a battle rating of 3.7 (AB), 3.3 (RB), and 3.0 (SB). It was introduced in Update 1.69 "Regia Aeronautica". It features a 102 mm cannon in its fuselage, one of the largest armament placed onto an aircraft. The P.108 serie 2 is your normal P.108, but with a 102 mm anti-shipping gun containing 50 rounds. In saying that, your basically an over sized HS 129 or PBJ-H1. The main reason for not seeing the aircraft on air AB, Rb or even Sim is due to the fact the plane is demanding on takeoff due to its low horsepower engines and will not take off if combat flaps or take-off flaps are down (if you don't, its going to be quite hard to take off). The defensive weaponry is decent for its battle rating but will not survive if it get up tiered to 4.3. 515 290 ??? ~?? ~? The Piaggio P.108A Serie 2 is a 4 engine attacker. Despite being a attacker the 102 mm cannon is relatively inaccurate which means the targets that suits this plane the best is usually stationary targets that the 102 mm cannon can penetrate and destroy. 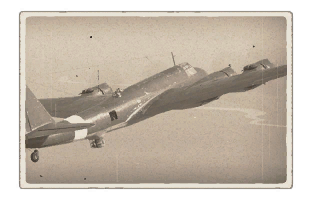 The plane's defensive firepower is relatively poor and you should try to avoid enemy planes as much as possible. If a enemy plane is lining up to attack you from the front, try to swing your plane and give him the tail of the plane so your gunners can shoot back at the enemy aircraft. Stay low and do not go above 1,900 m and speed is key try to maintain a speed of close to 200 kph as that gives you wiggle room as your stall speed is 155 kph despite the massive weight. 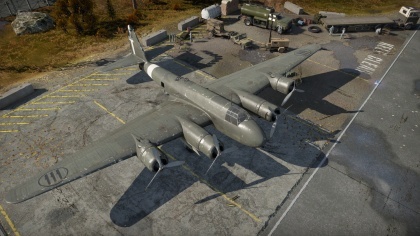 The first tier modifications to be unlocked should be Radiator and Fuselage repair then Offensive 7 mm. This is so you can improve the poor performance of the plane. The belts should be last as no matter what the defensive firepower of the plane with or with out the belts would still remain poor. The second tier upgrades should start with the Airframe so your plane is a bit more durable. Then get the New 7 mm MGs (turret) and Offensive 120 mm for increase in firepower and defensive armament. Finally go get the Compressor. The Third tier modifications should start of with the Engine, then unlock the Wing Repair. Last of all unlock the Offensive 12.7 mm. The fourth tier modification should start of with the New 12.7 mm MGs (turret) then Cover. And your last two modification should be Engine Injection and New 102 mm Cannons.